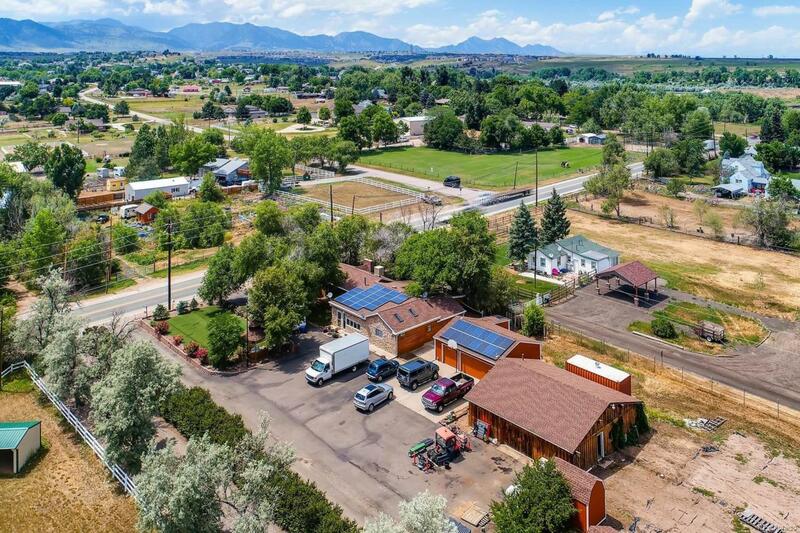 Meticulously owned 1.6 acre horse property in Arvada, CO. The opportunities of owning over an acre of A-1 zoned land in unincorporated Jefferson County are bountiful. 4 bed/2 bath ranch style home w/ nearly 2,200 finished sq/ft, 3 car finished detached garage, HUGE barn/outbuilding w/ concrete flooring, lift included, large stall doors, and 220v service, 3 additional storage units, and fenced pasture. All of this for you to have unlimited horses/livestock, operate a small business out of (see zoning uses), grow your own crops, etc. This house is "green friendly" and includes solar and tankless water heaters. Roof is 2 yrs old, Boiler is 10 yrs old, carpet is less than a year old, new copper plumbing installed, septic just pumped and inspected (use permit to be provided), reverse osmosis system, water softener, gas stove, circular drive way lined with rose bushes, no HOA, RV Parking, Ralston Valley HS feeder. YouTube the address "7640 Indiana St" to see a video tour of the property.